Yesterday continued to be bad beat city for us. Most dramtatic, Katja survived in the Limit Holdem $1500 event until level 7 when she found aces (3 betting preflop 3-ways), flopped an ace int the AJ6 rainbow flop and the flop got capped 2-ways. Turn brought a blank, lots of bettings, Katja finally went all-in. Pot-size was about 7,800, more than average stack at that time, showdown: Katja AA for set of aces, opponent KTo for a pair of tens. River Q, gutshot straight for opponent! My own experience in the same event was even worse, I survived only about 2 hours. When I had AA in the very hand of the event when only three players were already seated I knew right away that this was going to be odd – and I was right. I won’t go into the dirty details but I got 5 (!) real bad beats and finally went all-in with AKo (7 callers lol). Flop QJ5, one player was betting (no sidepot!) the flop, 4 folded, he bets the turn (2c), all other fold! When he said “you are in great shape” as he holds “only air” before the showdown I started to feel I have a chance. He showed 98 suited (lol) for no pair, gutshot straight draw. River sealed my fate with the 9 and he dragged the 1550 chips pot (1500 starting chips, 100/200 level, so that would have brought me back into the game). No comments. I played a $225 satellite a little later. With 4 players left I had the co-chiplead when I found the AK of diamonds and raised, one caller, the other chipleader. Flop JT6 with two diamonds. He bets into me (small, 300, into a 800 pot) and I re-raise him all-in (in fact we have been dead even in chips). He calle d me in second, showing Q6o. No help for me and the sat was over. I played a $525 satellite a little later but lost to two button steals (my AJs vs QTo and my KJo vs 64s) with only 3 players left and was out there also. It was late and Katja got tired so we drove away, Katja back to the room (she plays the NLHE 6-max $2500 today) and I went to the Wynn to play some cash games. Twelve hours later I came back to the hotel room to watch the Germany vs. Argentina match. Broke for the night. The grilled my there. Not that I was helpless or anything, I just could not get my good hands stand up. 5 times KK, lost (100%). Three times AA, all lost (100%). Flopped sets? Lost 8 (!) and won 1 (small pot). Some straights and flushes but most of them went down in flames. One those those days. The night was actually lots of fun as I was playing with Ben Lamb, who just cashed 25k getting 12th in the $1500 pot-limit event. He putted all his winning on the table and got drunk after some hours and the action got fast and furious soon. 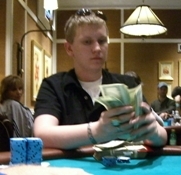 Ben just won the first place in the Scotty Nguyen Poker Challange II $1000 event so he was feeling like king of the world. My guess is he lost to the tune of $4000 there… not that I got anything from it, the only hand I could make against him was a flopped straight but he had a set of queens and rivered another queen so he got some relief from me. Anyway, I liked the guy, he was funny and he knew how to play, just over-tired and drunk. Sebastian sent me this link, enjoy!